It happens all the time: a client’s business changes or a new stakeholder gets pulled into a project, and you’re forced to have discussions about things that were 90% complete or possibly already approved. This type of thing can kill morale, draw out timing, and completely drain a project budget. The first reaction of the PM is to build a wall to ward off impending scope creep. But that’s impossible because scope creep isn’t a person or an animal you can tame—it’s an idea that can spin your project out of control. So how do you tame scope creep on your projects? It’s your job as the project manager to act as both the project gatekeeper and the cheerleader, to monitor, manage, and report on its progress, and to nobly guard your project estimate, scope, and timeline with courage and diplomacy. Any change, additional request, or new requirement can bring a bit of project stress for any PM. Any change, additional request, or new requirement can bring a bit of project stress for any PM. But when you’re caught up in that moment, it’s always good to remember that you’ve got a lot to fall back on, provided you've done your due diligence and have truly read and understood your scope, built a plan based on that scope, and have completely vetted it with your team and your clients. TeamGantt Tip: Keep a file shortcut or a local folder of documents on your desktop so that you can refer to them quickly. This should include copies of your most recent plans, scope of work, and estimates. Having them handy will save you time as opposed to wading through folders. The initial steps of a well-constructed PM process will truly carve a path to success for you—and your project. Don’t ever be shy to stop a conversation and say, “Let me refer back to the estimate/scope/plan and get back to you.” You should never expect to (or be expected to) have every detail committed to memory—especially if you’re responsible for more than one project. So take your time, don’t jump to provide an immediate answer, and always remember that a solid response is going to have the best impact. Remember all of that work you put into your plan? Don’t let it all go down the drain by succumbing to every new issue and request. That first version of your plan is your baseline, and it outlines every step you need to take to get from the beginning to the end of your project. You don’t just make these things up! If you’re doing it right, you’re basing it on your estimate and scope. Sure, plans can change, but referring to that first plan as your baseline will often help you in arguing the case for more time or more budget when new scope starts to creep in. Stick to the plan and use it as your project’s roadmap. 1. Provide an updated project plan. Update all impacted tasks, and keep notes on extensions in your newest version. For instance, if a client milestone is missed and a deadline is extended, make a note in the planned task. Most planning software includes a handy “notes” field, so it’s easy to note, “Baseline date was [month/day/year/], Actual was adjusted to in of this plan on [month/day/year/] due to [reason].” After you’ve updated everything and double-checked your dates, make a new version and save the old one in a safe spot. 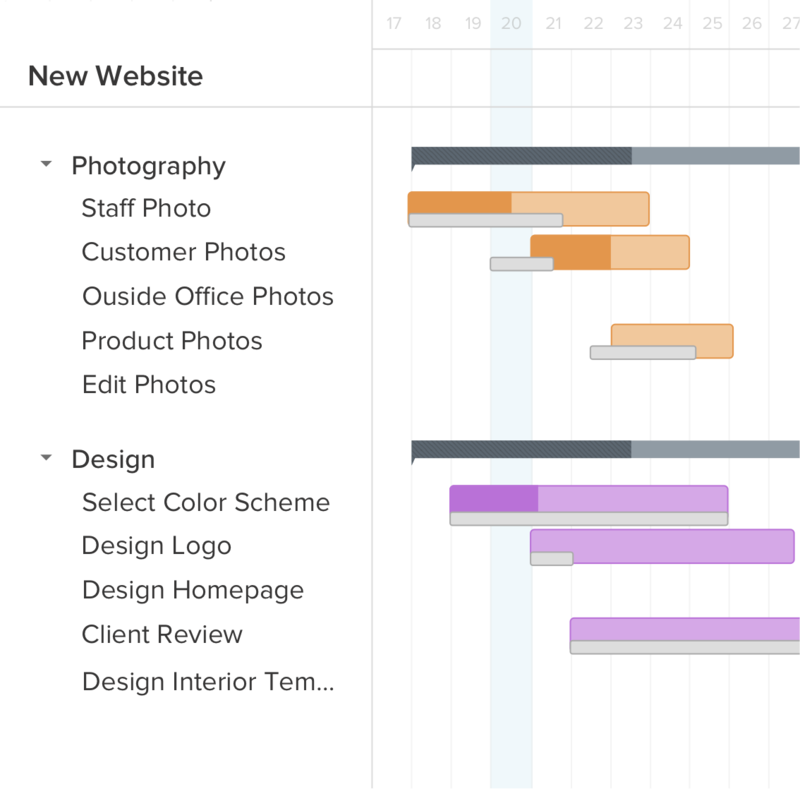 TeamGantt Tip: Drag and drop to update your plan and get an answer on new timing within minutes. You should also baseline your plan to keep track of the many versions you might encounter. To create a new baseline set, open the project (or projects), and click Menu > Baselines > Create New Baseline Set. TeamGantt Tip: Dependencies in a gantt chart can be really helpful when you have a project requiring tasks to be done in a certain order, so be sure to check those out in TeamGantt as well. This way, when you reschedule a task, other tasks that are dependent on it will automatically be rescheduled as well. 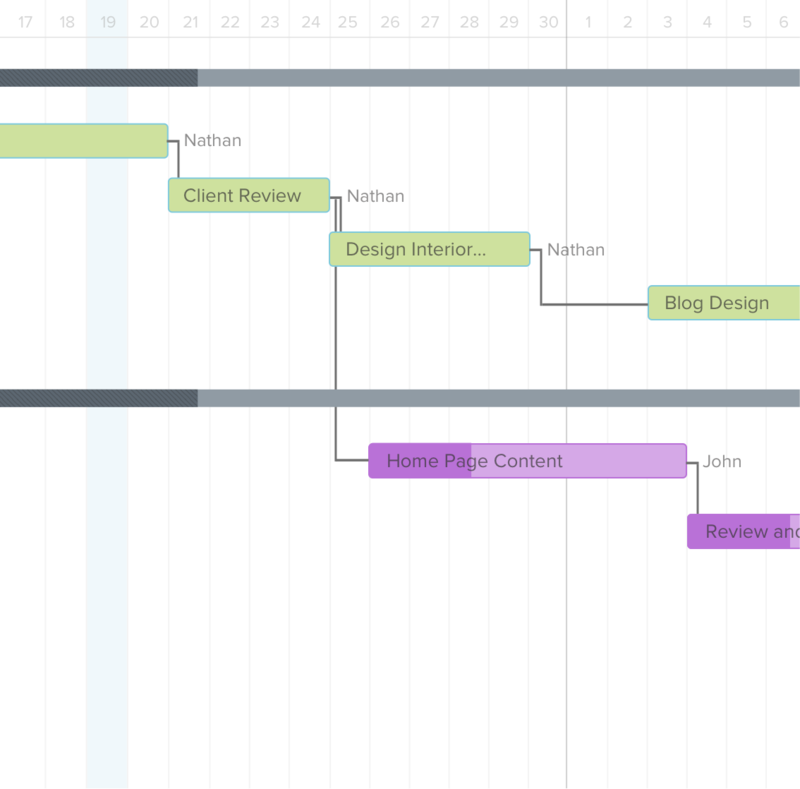 Create a free interactive gantt chart using TeamGantt today! 2. Provide an update in a project status report. You should always be reporting on current timeline status in your regular status reports, so it’s a perfect spot to report on the updates you’ve made to your plan. You might choose to replicate the note made in your plan or even attach the plan for review and discussion. A date is a date. If someone misses a deadline, your next delivery and the final deadline will be impacted. 3. Discuss changes and impacts. A date is a date. If someone misses a deadline, your next delivery date might be impacted, as well as the final deadline. Missing deadlines will most often cause an impact, whether it be on your resourcing plan, the next delivery, or the final deadline. Don’t fear the conversation about timeline issues and impacts, especially if you’ve made the time to discuss and review your baselined plan. Talking things out while a change is happening will help everyone to understand what is affected. 4. Note or add the change in your project requirements document. This document is created for your team to review/revise and check against throughout the project. Don’t forget to refer back to it and keep it up to date since there are times when the document can become buried in the project. Be open about your change control process. 5. Be open about your change control process. What if there is an associated cost? People hate talking about money. It’s your job to talk about things that people hate. That’s just how it is for project managers. So, the best way to approach topics like budget overages and scope creep is to handle them head on and document, document, document! But it often doesn’t just start with a document! It starts with the work and the conversation surrounding that work. If you’ve read Chapters 1 and 2, you know that project managers need to be in constant communication with their teams. Starting a project must begin with clear communication of the project goals and the effort required to meet them. This comes with understanding the fact that a project manager can’t be the only one writing a project plan. Sure, you could try—but if you’re interested in team buy-in, you won’t. The reason you won’t is because you don’t want to put yourself or your team in an awkward position by not coming to a consensus on the approach before presenting it to your client. Doing that would be like stabbing every single one of your coworkers in the back. Not so good for the old reputation. People hate talking about money. It’s your job to talk about things that people hate. A change in scope should never be a surprise to you or your clients. They wouldn’t call it “scope creep” if it didn’t slowly slither up on you. Sure, some requests are obviously out of the boundaries of your scope, and you can address them immediately. But there’s often that one feature or requirement that starts as a manageable piece of scope and slowly evolves into something else. This, my friends, is scope creep. And it’s your job to keep an eye on these things and make sure that they are not killing your budget. When you do realize that they’re going to kill your budget, use your documentation and status reports to call out the issue. The first step would be to reassess the budget and note where the work is trending. Take a look at the project hours and estimated effort, then check in with your team to see if they would estimate an overage. If they confirm, you need to make your clients aware right away. If they think it’s fine and you’re just being an alarmist, you might want to let your clients know about the potential risk anyway. It never hurts to show that you’re thinking ahead and being budget-conscious. The best way to do this is to make it formal. Create a “Risk/Issues” section in your status report so you can write out potential issues and then discuss them with your clients. Discussing the issue might feel uncomfortable, but it doesn’t have to be. Calling things out early will give you the time to think through a mitigation plan and discuss it with your clients. Plus, by not waiting until the very last minute to call out the issue, you’re positioning it in a way that will help everyone involved to devise a reasonable approach to the change; you always have your scope and baselined timeline to back you up. 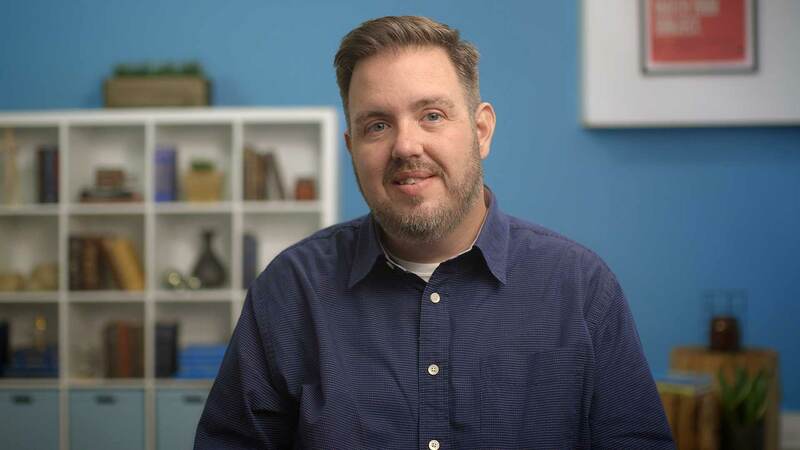 A well-researched and planned discussion surrounding the risk of scope creep will help put you, your client, and the potential issue at ease. Anything can be sorted out with planning and discussion. What if the client says no? Can you trade scope? Meaning, if your team does let scope creep commit a hostile takeover, can you cut something else from the project to make up for lost time and/or budget? How will the change impact the quality of the product? If it’s going to make it worse, how does that impact your bottom line? Is your company willing to “eat” some of the cost in order to develop a better product and keep the clients happy? If yes, what is that cost? No matter what the answer is, you’ll need the buy-in of your team and management to make the change that is best for your project, your clients, and your company. It’s never an easy decision to make. What will make the project a success? Asking these questions will help your team set some targets within the context of your project budget and timeline. Having goals helps you set the stage for how you can meet them within the constraints of the project. Goals can also help you gauge the validity of new requests as they come in. If you’re experiencing scope creep and the work doesn’t actually meet a goal, it’s much easier to cut it out. The best PMs take the time to diagnose scope creep, study it, and develop an approach to accept or deny it. A good project manager can sense scope creep the minute it’s hinted at. A better project manager takes the time to diagnose the scope creep, study it, and develop an approach to accept or deny it. The best project managers take the time to get through all of those steps and approach the situation with a level head. Any project problem—scope-related or not—can be resolved with a conversation that references previous work you’ve done on your project. In fact, all of the time you put into creating an estimate, scope, and timeline will make approaching any problem easier.